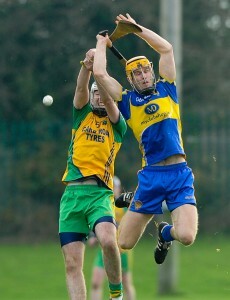 Chris O Looney of Inagh-Kilnamona in action against Shane O Brien of Newmarket during the Clare Champion Cup final at Clarecastle. photograph by John Kelly. Newmarket-on-Fergus completed the first three-in-a-row in the Clare Champion Cup for over 30 years on Saturday, their club pocketing the €3,500 winners prize in the process. 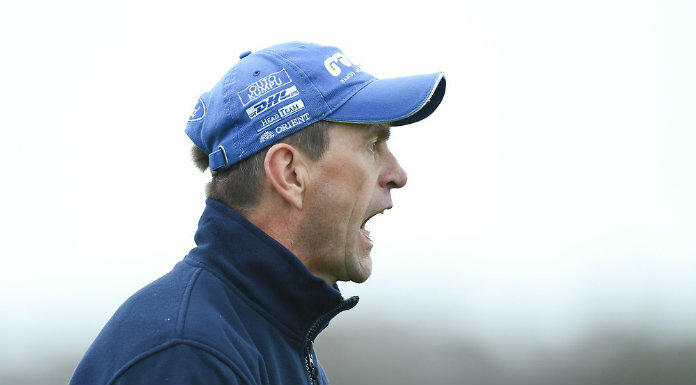 The Blues were without doubt the better side and as early as the ninth minute, when Shane Liddy had their second goal, it was hard to see them being beaten at a Clarecastle venue that was in great condition for the time of year. Inagh/Kilnamona trailed for nearly 90% of the game, but they fought as best they could and did mange to cut an eight-point half-time deficit to four but, crucially, they never brought the gap back to a single score, which could have really tested Bob Enright’s men. 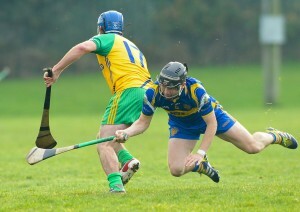 Eoin Vaughan of Inagh-Kilnamona in action against Eoin Hayes of Newmarket during the Clare Champion Cup final at Clarecastle. photograph by John Kelly. The early goals were crucial and the Blues had clearly decided to focus on green flags. After seven minutes they trailed 0-3 to 0-2, but had already gone for majors on three occasions when points were there for the taking. If they kept prioritising goals it seemed inevitable one would eventually arrive and it came after the fourth attempt, Stephen Kelly rounding captain Milo Keane and driving beyond Patrick Kelly. Their fifth goal attempt came quickly afterwards, Patrick Kelly parrying Shane Liddy’s first shot, but Liddy drove the rebound to the net, leaving it at 2-2 to 0-4. Colin Ryan had the next three points, making the gap seven after 25 minutes, before Gerry Arthur steadied Inagh/Kilnamona with a good score from the right wing. With points traded in the closing moments, the score at the break was 2-8 to 0-6, after a relatively one-sided 30 minutes of hurling. 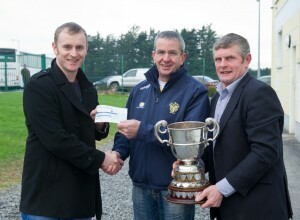 Chairman of Newmarket GAA Pat Keogh, centre, is presented with a cheque to the value of €3500 by Owen Ryan, of The Clare Champion watched by Joe Cooney, vice chairman Clare GAA, following their Clare Champion Cup final win at Clarecastle. Meanwhile, the Inagh-Kilnamona club recieved a cheque to the value of €1500. Photograph by John Kelly. Could Inagh/Kilnamona turn it around? It didn’t seem likely when Shane O’Brien pointed after a minute, but then things started to happen for the combination side. Gerry Arthur, Damien Lafferty from a sideline, Eoin Vaughan and then Niall Arthur all got on the board to reduce the gap to five. In the 39th minute, sub Haulie Vaughan made his first play, finding Eoin Vaughan, who cut it to four points, with the North Clare men having all the momentum. However, that would be as good as it got for them, with no further inroads being made into the winners’ lead. Ryan, yet again the day’s top scorer, pointed a free and although Niall Arthur replied, Eoin Hayes, who made a big contribution, stretched the lead to five again, 2-11 to 0-12 with 16 minutes left. 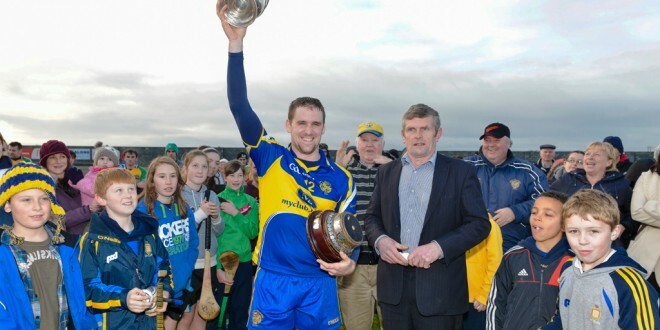 Colin Ryan of Newmarket lifts the Clare Champion Cup following the win over Inagh-Kilnamona in the Clare Champion Cup final at Clarecastle. 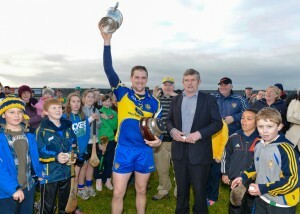 To the right is Joe Cooney, vice Chairman of Clare GAA who made the presentation. With 10 minutes left. the gap was four again after Niall Arthur pointed a free for Inagh/Kilnamona but the winners completely dominated from there on, scoring seven points to the amalgamation’s one. Colin Ryan had the first two, one from play and one from a free, then David Barrett was on target, then Martin O’Hanlon, then centre-back Niall O’Connor and then O’Hanlon again, with his side’s sixth point in six minutes. Kevin Hehir had a consolation score for Inagh/Kilnamona with the final score of this year’s Clare Cup from the stick of Noel Frawley. While the contest wasn’t very close, there was still some needle during the second half, which resulted in some yellow cards being produced. One of the talking points was the battle between Milo Keane and Stephen Kelly, with both sidelines and supporters, perhaps inevitably, arguing that their man was getting unfair treatment. While it was hardly edge of the seat stuff, there were some patches of food hurling and the Blues put together some outstanding moves. They would surely have preferred to win the other final they were involved in this month, but winning a third successive Clare Champion Cup will provide a consolation and allowed them to finish the year on a very positive note. Newmarket- on-Fergus: Darren Duggan; Eoin O’Brien, James McInerney, Sean O’Connor; Shane Kelleher, Niall O’Connor, Alan Barrett; Eoin Hayes, Martin O’Hanlon; David Barrett, Shane O’Brien, Colin Ryan; James Liddy, Stephen Kelly, Shane Liddy. Subs: Ronan Goode for James Liddy, Noel Frawley for Shane O’Brien, Mike McInerney for Shane Liddy, Shane O’Brien Jnr for David Barrett, Evan Keogh for Alan Barrett. Scorers: Colin Ryan 0-9 (6f, 1 65), Stephen Kelly 1-1, Shane Liddy 1-0, David Barrett 0-3, Martin O’Hanlon 0-2, Shane O’Brien, Eoin Hayes, Mike McInerney, Niall O’Connor and Noel Frawley all 0-1. Yellow cards: Stephen Kelly, Martin O’Hanlon. Inagh/Kilnamona: Pa Kelly; Sean Devitt, Milo Keane, Dermot Lynch; Chris O’Looney, Damien Lafferty, Brian Hehir; Tomás Kelly, Kevin Hehir; David McCarthy, Gerry Arthur, Eoin Vaughan; Gerry Coote, Cathal Lafferty, Niall Arthur. Subs: Haulie Vaughan for Gerry Coote (38 mins), Shane Griffin for Cathal Lafferty (57 mins). Scorers: Niall Arthur 0-6 (5f), Gerry Arthur 0-4, Eoin Vaughan 0-2, David McCarthy, Damien Lafferty (lineball), Kevin Hehir, Gerry Coote all 0-1. Yellow cards: Eoin Vaughan, Cathal Lafferty, Dermot Lynch, Milo Keane, Damien Lafferty.